Image Search allows you many ways to filter the results. You can filter by size, color, type, and usage rights to name a few. Size and type are probally the filters that are the most popular. When you are seeking an image for a project you very likely want an image of a specific size. Likewise, filtering by type - photo, clip art, face, line drawing - is a criteria you would use in a project, blog, or website. For example, in developing a site for students I may want to use clip art over other types of images. Color may be a filter you would use less but could serve useful in designing a website. For example, you are looking for images to go with your red website theme. You very likely would want to filter your images by the color red. Another use of the color filter is transparency. I often look for images that are transparent because then the background of the website or blog doesn't matter so much. I may find an image whose background is black and looks ok with a dark theme, but then negatively stands out in a light theme. With a transparent image your background or theme does not matter so much in selecting an image. The mother of all filters is usage rights which mainly filters by copyright permissions. This can be very important with student projects especially if they are being published in some way. Google allows you to filter by reuse with modification, reuse, reuse for commercial use with modification, and reuse for commercial use. The most free (as in freedom) of these permissions is reuse with modification which allows you to reuse the image, modify it for your own purposes, and use it commercially. 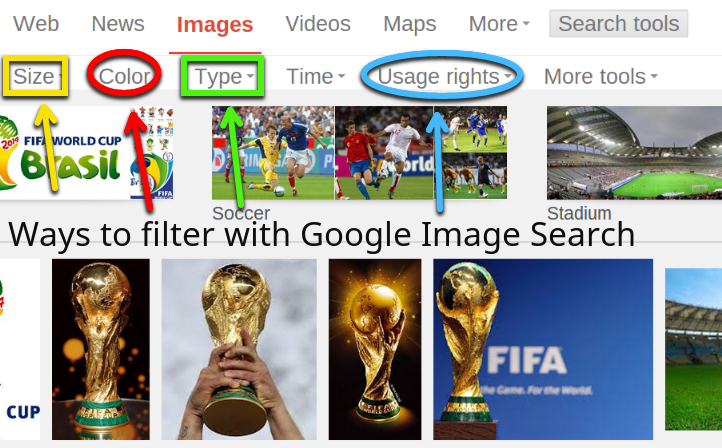 In the following video, I take you step by step through a Google Image Search for the term World Cup.